So Many Stamps So Little Time: Smile - Feeling Pinspired! To create my card I used a much loved stamp set, Rosie Posie. I know, I know, this set is ALL over the web, but darnit, I love it! And I love it even more with the addition of the "Step 2" set a few months ago. It is so easy to stamp something beautiful with these sets. 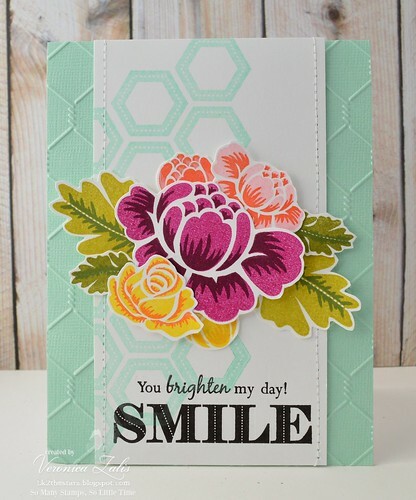 The "smile" sentiment is from the new PTI Stamp-a-Faire set "Reasons To Smile", and the $5 PTI set "Lighten Up Sentiments". My embossed chicken wire background was creating using a new folder I picked up this weekend by Cuttlebug. This is going to get a lot of use in my craft room! I am happy you stopped by and I hope you have a fantastic week! your card is just lovely - i'm going to pin it! SOOOO beautiful!!! 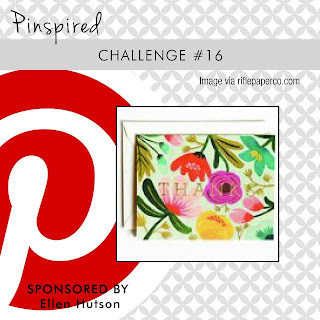 Thanks for linking this pretty card up to PINspired this week...amazing!!! Awe, thank you Lalo! The inspiration picture is so pretty this week! Just gorgeous! It say "pow" with its color. Thanks for joining us at Pinspired Challenges! Wida is right this is gorgeous! wow this really is stunning.. thanks for joining us at PINspired Challenges.. I found this LOVELY on CHUPA"s PINTEREST board.. The chicken wire embossed bg is so cool paired with ROSIE POSIE! Love, love, love, love everything about this card. The embossing, the main flower element, just EVERYTHING. Your style is amazing!!! this is so so beautiful!!! if a stamp set is everywhere it's because it's awesome... you just proved it! Lovely, Love the brightness of thei FAB card!! Fall Is In The Air - Finally! Papertrey Ink Make It Monday - Boo To You! Honoring Hombre - A CAS Card!